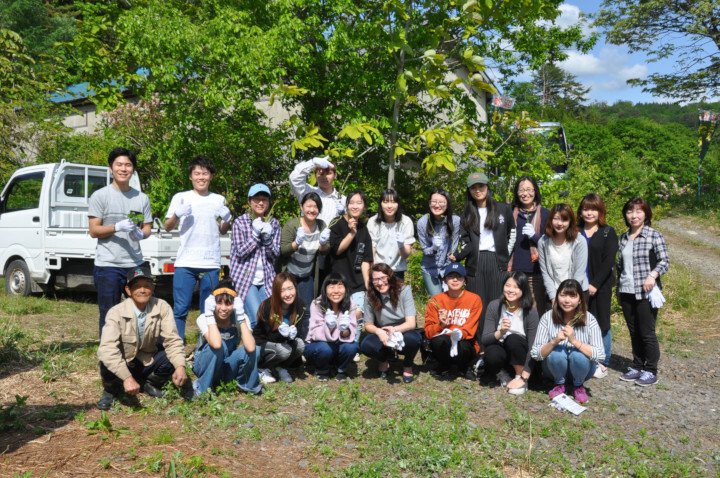 Mihye (rear, 8th from right) with her International Perspectives on Japanese Society classmates visiting a bracken farm. Student exchange programs provide you with opportunities to broaden your horizons by being exposed to unfamiliar milieus. However, it is more difficult than anticipated to make deep observation, discussion, and understanding of cultures. To students who have special interests in comparative study in cultures, I would like to recommend “Intercultural Perspectives on Japanese Society”. As it is conducted in Japanese language, it requires a certain level of Japanese language ability. If the language ability is met, this course will be a unique experience. In this class, students learn some vocabulary terms related to the theme of the week and hold discussions. Students compare and share experiences from their home countries. Topics we have covered so far are Japan's holidays, religious beliefs, views on education, and community development. It was a good time for both international and Japanese students, because we could give critical reflections on what we could not easily catch in our everyday life. Also, by interacting with many international peers from Asia, I could discover diverse cultures in Asia, which is often merely thought to be similar. Also, this class includes several field trips. We have visited Karamatsu Shrine (唐松神社), a famous Shinto shrine in Akita, and to Yokote (横手市) so far. At Karamatsu Shrine, we learned the meanings of elements in the shrine and participated in religious rituals, rather than just looking at it. On the trips to Yokote, I took a bicycle and enjoyed the beautiful scenery of streams and large rice paddies. I also met local people in the town market, cherry farm, and Warabi (bracken) farm. It was an invaluable experience that I may not have in big cities. Picking Warabi and cherries made a great escape from everyday life especially for someone like myself who is accustomed to metropolitan life. According to cultural anthropology, a culture can be studied only by sometimes thoroughly sinking down into it, and sometimes by taking a step back. I strongly recommend this class to those students who want to enrich their intercultural understanding beyond culture shock. In addition to learning Japanese culture and language, I could study and contemplate the world that I live in. Venturing actively into various cultures would enable you to find where you are on this planet.